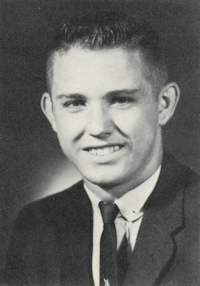 Obituary – Brand, Raymond Keith « Perry High School Alumni Association, Inc.
﻿Football 62-65, Basketball 62-65, National Honor Society 62-65, Sophomore Class Vice President, Student Council 62-65, Baseball 62-63, F.F.A. 62-65, F.F.A. President 63-64, F. F. A. Vice President 64-65, Mu Alpha Theta 63-64, Home Room Secretary 64-65. Funeral will be at 2 p.m. Wednesday at the First Baptist church of Perry for Keith Brand, 40, Sand Springs, formerly of Perry, who died at 4:44 p.m. Sunday at Hill-crest hospital at Tulsa. Rev. Bob Lee will officiate. Burial will be at Grace Hill cemetery. Visitation has been scheduled at the funeral home. The casket will not be opened at the church. Memorials may be made to the American Heart association. Brand, the son of Raymond and Vernie Brand, was born at Perry, Jan. 16, 1947. He was a graduate of Perry high school and Oklahoma State university. He was a veteran of the United States Army and served in Vietnam. Brand and the former Lila Zavodny were married Sept. 3, 1967. Brand had been a resident of Sand Springs since 1981. He moved from the local area to Tulsa in 1973. Brand was a certified public accountant employed by Williams Pipeline company. He was a member of the Baptist church. In addition to Mrs. Brand of the home at 401 West 33rd street in Sand Springs, survivors include one son, Adam, and a daughter, Amanda, both of the home; his parents, Mr. and Mrs. Raymond Brand, Perry; and a brother, Ted Brand, Perry.